When you're ready to build strength and develop a tight and toned upper body and core, look no further than the push-up. The push-up requires no gym membership, no fancy equipment and is an effective exercise for everyone from newbies to heavy lifters. With just one simple exercise, you'll work several different muscle groups, and you can continue to increase the difficulty of the exercise as you get stronger. You can even work pushups into a quick high-intensity routine for calorie-burning if weight loss is your goal. Push-ups are a compound exercise, meaning they involve the use of more than one muscle group and joint. To do a push-up your arms, shoulders, chest, back, abs and even your legs -- and all the joints that move when those muscles move -- need to activate to complete the movement. While your chest muscle, or pectoralis major, is the main mover, your triceps on the backs of your upper arms and your deltoids, or shoulder muscles, are also synergist muscles that play major roles. Your rectus abdominis, or your abs; your obliques that run along the sides of your midsection; your quadriceps on the fronts of your thighs; and the erector spinae muscle along your spine all work to stabilize your body throughout the movement. In short: You get a lot of bang for your buck when you do push-ups. What could be of more benefit when trying to build strength and muscle tone than the ability to do an exercise anywhere, anytime and with no equipment necessary? In the kitchen waiting for water to boil? Drop and do some push-ups on the kitchen floor! Out for a run in the local park? Work in a few sets of push-ups along the way. You can even do them in your office or at school. As an added bonus, push-ups get your blood flowing, which can be energizing. If you're in a mid-morning slump at work, just do a set or two of push-ups and you might not need that extra cup of coffee. While they're often the go-to exercise for building chest strength, push-ups do double duty. In order to stabilize your body to achieve perfect form, the muscles of your core, including your abs, obliques and lower back are hard at work. Having a strong core doesn't just mean toned abs; a strong core promotes good posture and prevents back pain. Strength-training exercises aren't generally thought of as big calorie-burners, but they can be. 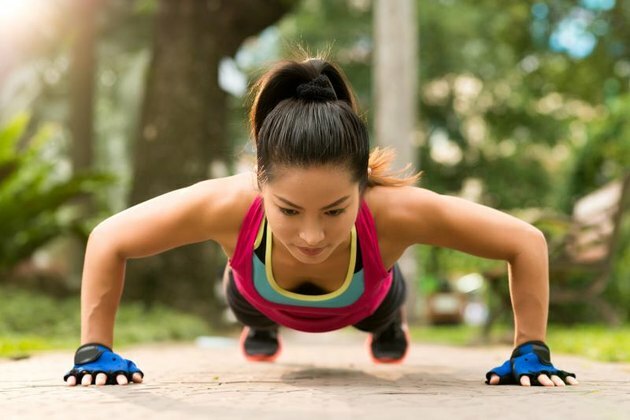 Because so many muscles are involved in a push-up, the exercise helps you torch more calories than many other exercises that only involve one or two muscle groups. This is because the more muscle recruitment that takes place during a movement, the more energy your body requires to perform the movement -- energy in the form of calories. You'll burn more energy doing a push-up than you will doing a triceps push-down, crunches, or even bench presses. Want to burn even more calories with push-ups? Do burpees. Burpees combine a push-up and a squat jump into one intense, cardio-boosting exercise. HOW TO DO THEM: From a standing position kneel down and put your hands flat on the floor in front of your feet. Jump your feet back so you're at the top of a push-up. Complete one push-up. Jump your feet back up to your hands. Rise up, jumping into the air at the top. Land with bent knees and do another repetition. There are so many different variations of push-ups, no skill level is left out of reaping the benefits of this exercise. Beginners can do push-ups against a wall by walking their feet out away from the wall far enough to make the exercise challenging. Push-ups can be done with hands on a bench. The traditional push-up on the floor can be made easier by leaving the knees on the ground to support some body weight. If you need more of a challenge, you've got options. Elevate your feet, do clapping push-ups or put a weight plate across your upper back. Be sure you can do eight to 12 traditional push-ups with perfect technique before you progress to more advanced versions. Is Doing Push-Ups Every Day Bad?